How the tides have turned. There was a time when Shakespeare in the Park involved a mostly serviceable if unexciting crop of actors churning out the Bard's tales in Fort Canning Park. Productions tended to draw haphazardly on elements seen in more successful versions abroad and relied on spectacle (ships! helicopters! multi-tiered sets!) to entice the crowds. Now returning after a one-year absence due to high production costs, director Guy Unsworth gives us one of the most coherent, well-conceived and engaging versions of the outdoor theatrical event yet. 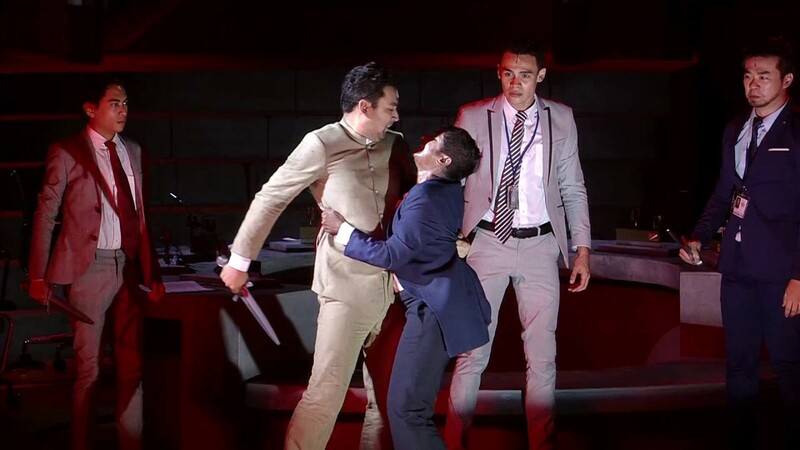 His Julius Caesar is a slick political thriller for our times, taking the ancient tale and placing it squarely into the world of charismatic politicians, casual terror and the clamorous paparazzi. Rome has been replaced by R.O.M.E., an intra-governmental organisation of seven nations akin to the ASEAN or G7, and the action takes place around its purpose-built Capitol over the course of an international summit. Caesar (Jo Kukathas) is a world leader at the height of her power, whose popularity and promotion to the head of the organisation breeds ill-will amongst the other leaders. 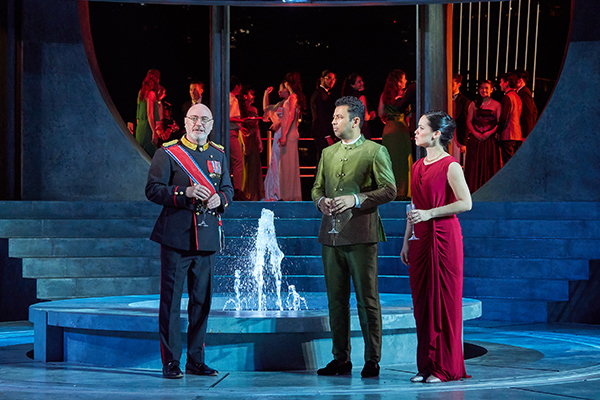 A plot to assassinate her is quickly conceived by a resentful fellow leaders Cassius (Julie Wee) and Caesar's erstwhile loyal friend Brutus (Ghafir Akbar), speaking violence and uproar. The idea of the celebrity-politician is not a new one and has been explored in other Shakespearean productions like Sam Mendes's cinematic Richard III or Wang Chia-Ming's inventive history pastiche Blood & Rose Ensemble. Unsworth's production embraces this idea, highlighting the sway of charismatic world leaders whose daily lives provide a constant source of drama. Coming hot on the heels of the landmark Malaysian general election, uncertain political climate in the region and ever-increasing criticism of leaders like Donald Trump and Kim Jong-un, the tensions in R.O.M.E. are certainly not far from the tumultuous world we live in. 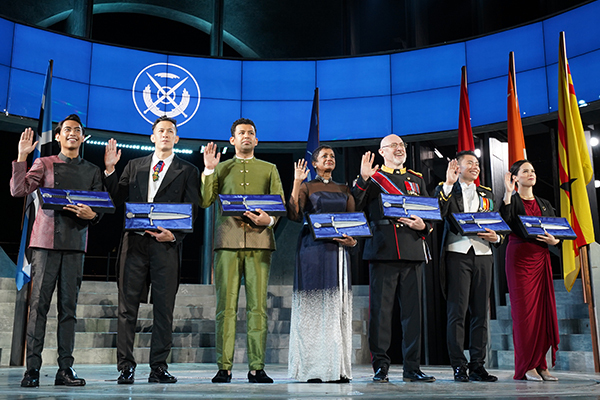 Caesar marks a trend towards an increasing maturity and diversity in Shakespeare in the Park productions that boast strong visions of their own. We first saw this a couple of years ago in The Merchant of Venice where Shylock and his kinsman Tubal were portrayed by Indian actors, creating an obvious visual contrast from the rest of the largely Chinese and Caucasian cast while nodding to the chettiar moneylenders of colonial Singapore. Unsworth pushes this even further, casting women in the traditionally male roles of Caesar and Cassius. The idea of the female leader in a world of men is a brilliant and topical one. The idea of Caesar ruling the roost in R.O.M.E. immediately brings to mind the possibility of Hilary Clinton coming into the White House. How would things have turned out? The production even hints at how Cassius, a younger and more ambitious woman, is threatened by the authoritative Caesar. The costumes deliberately bring this out, Caesar's royal blue in obvious contrast to Cassius's more feminine colours of red and pink. Yet it is somewhat unfortunate that the production does not fully exploit the potential of this alternative reading of the text. There are inconsistent references to the pronouns that keep us from buying fully into this world. Not all the "he"s have been replaced by "she"s and Caesar is bizarrely referred to several times as "my lord". The idea of a female Cassius pitted against a male Brutus allows for a sexual tension to simmer under the surface - one only wishes this was pushed further. Veteran actress Kukathas cuts a striking figure as Caesar and delivers crisp, penetrating verse that carries her scenes. Wee and Ghafir set the stage ablaze with their chemistry as they debate the importance of ridding Caesar for the greater good of the organisation. Thomas Pang lends a suave presence to Mark Antony, a fierce supporter of Caesar's who later forms a vigilante group to avenge her death. There are also strong supporting performances by the likes of Daniel Jenkins as Casca, Edward Choy as Decius and Tia Andrea Guttensohn as Portia. Richard Kent's set is grand and economical, transforming easily from an outdoor atrium to a senate chamber. Rain lashes the backdrop while lights dance around the stairways. There is a hint of the Roman Colosseum here, signifying a link to tradition, but this is updated by a giant curved screen that displays a stream of news in real time alongside social media updates. Characters are constantly hounded by the press and we see their image projected on the screen. This continues throughout the interval as news of Caesar's death is announced. Unsworth has edited and rearranged sections of the original play to sharpen the narrative and uses multimedia to great effect. In a chilling video sequence, the hooded Casca's neck is slit in a manner reminiscent of ISIS beheadings. Elsewhere, riot police bombard the stage amidst dusky red lights as chaos reigns the state. Despite the numerous scene changes, the production remains incredibly well-paced and builds to a satisfying climax. Gabriel Chan's lighting, Control Fre@k's sound and Jude Obermüller's evocative music fuse together to transport us into this majestic, frightening world of intrigue and passion. 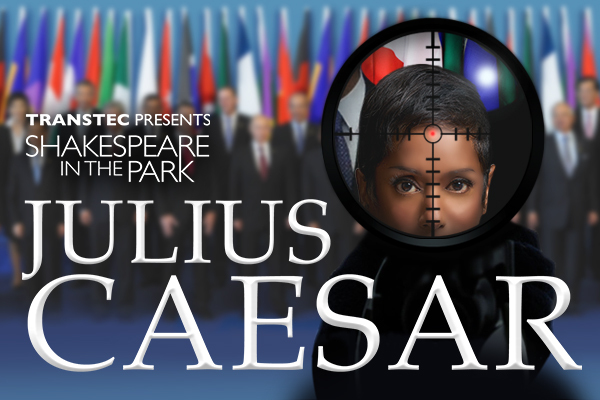 Unsworth's Caesar, ultimately, marks a very worthy return of Shakespeare in the Park. His production successfully blends blazing drama with strong, deeply rendered performances and a coherent vision that taps into the fractured political milieu of today. This is how Singapore should be doing Shakespeare: powerfully, innovatively and with thrilling insight.